This market seems totally random due to the pop up show from the US government and the systematic risk introduced by the EU nations, especially, those known by the acronym PIIGS. Looking at the market action for the past two weeks, random walk theory seems to make sense. But have you zoomed out and took a longer term view? Money managers on popular business media such as CNBC have come out and expressed concerns of a bigger correction: The S&P, for example, has only come down 7% or so and we need at least 10% to define the down action as a correction. My take is that they may be true. But, the weekly charts of the majority of the stocks tell us otherwise. The majority of the stocks look the same probably because everything moves in tandem these days. As an example, I’m going to use XME (SPDR Mining and Metals ETF) and, its member, STLD(Steel Dynamics) because I’m interested in metals these days and because I have a small seed position in STLD. We’re going to look at the weekly charts opposed to the daily charts. 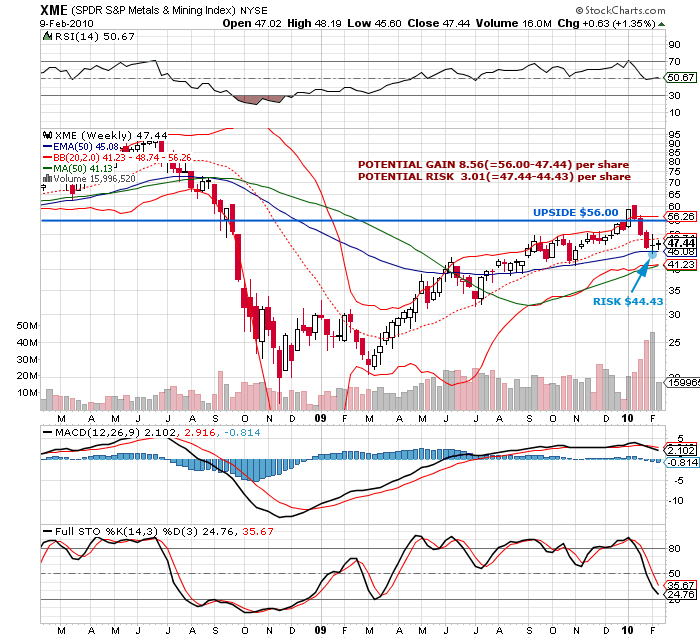 XME has tested its 50EMA and it’s slowly making progress for now. Would this be a failed bounce? It could be, which means that there is some chance of a failure being wrong. So what do you do? You *test* it. Define your risk a little bit below the 50EMA, define how much you are willing to lose, and calculate the number of shares you want to start your position. For example, it closed at 47.44 and its 50EMA is 45.08. 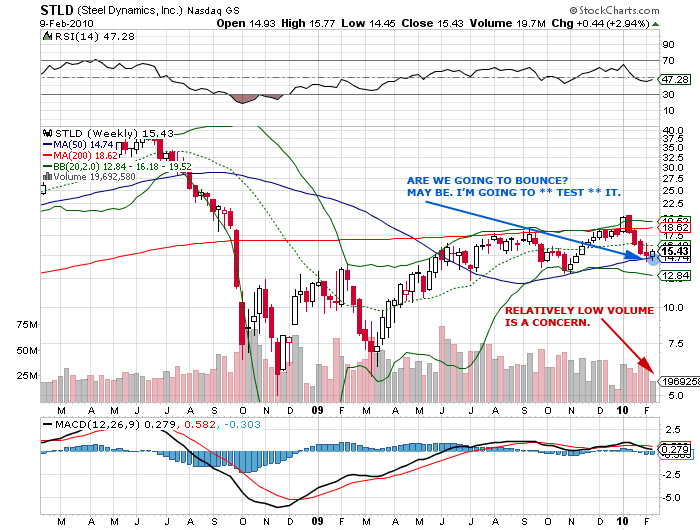 I would define the risk at around 44.43 which is the low last week. You’re looking at a downside of 3.01(=47.44-44.43). You’re willing to lose $X. The initial number of shares you should invest in it is ($X/3.01) shares. Now how would you define reward? I would define it near the top bollinger band at around 56.26 because everything moves along the averages and the more the price moves away from the averages the stronger the force to bring it to the averages. To be a little bit conservative, I would say 56 at which point you would have gained 8.56(=56-47.44). Now you have a risk reward ratio of around 3(=8.56/3.01). 3 is not that great but in this tight market, it’s somewhat ok. That was pretty easy, wasn’t it? Once you have everything defined, you can be more “disciplined”: You can place your trade at night or in the morning and check it at the end of a work day. You can apply the same method in any other stocks, ETFs, bonds, etc. Now let’s look at STLD. You can see a similar pattern: It’s testing its 50MA. Today, STLD ranked 13th among the 21 metals and minings stocks in XME. The 1st being CMP with a 10.25% gain. Why STLD among many other metal stocks? The greatest potential in STLD is its acquisition of a privatly held major metal scrap provider Omnisource in 2007. Everything needs to be recycled as Earth itself is limited and as such I think STLD is well poised for the future and the near future when construction and manufacturing picks up or, in other words, the US economy truely picks up. One other imporant fact is that STLD is in the black after a year of losses. STLD seems like a good place to truely be in the long run. Am I recommending STLD? Not really. I don’t have that much conviction on my analysis; I don’t do this for a living. These are simply my reasons for waiting for opportune moments to build my position. If you’re thinking of getting in, get your own reasons because they are important; charts only tell you what happened in the *past* and when the good entry points are based on *historical behaviour*.